"Benefits of smart mobile devices in healthcare"
Smart Devices in Medical and Healthcare: How mobile technology is transforming healthcare today?What is the use of smart devices in healthcare?What is the impact of mobile technology on healthcare?What is the future of mobile technology in healthcare? Use of Smart devices by healthcare professionals is growing rapidly in accordance with consumer usage, transforming clinical care and practices while enhancing better patient care. 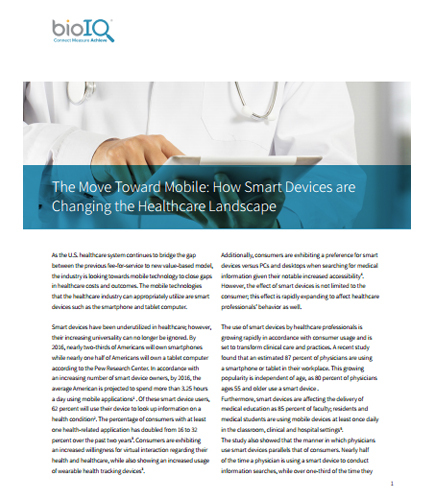 The benefits of smart mobile devices in healthcare along with handheld networking devices used in healthcare—both serve as promising solutions to help curb the growing prevalence of costly chronic conditions and the factors leading to them. The use of smart mobile devices in healthcare 2016 has enabled professionals to gather real-time data that go far beyond the scope of information captured in brief clinical consultations. Today, the integration of mobile technology in healthcare has become a critical aspect to improve patient care along with the healthcare environment in total. What are the significant advantages of using mobile technology in healthcare? How can smart devices help to reduce healthcare costs? What opportunities smart devices has opened in healthcare? Guide to Mobile Labs :Jump Start your Mobile Device Testing Lab and make sure your testing plans meet your business goals Starting a mobile lab and Initiating a testing program for enterprise mobile apps can look like an impenetrable wall. Mobility presents new challenges that, once understood, do have logical solutions. The most successful mobile enterprises manage to retain the traditional goals of QA testing, while incorporating new requirements brought forth by mobile labs, and solving new challenges that mobility imposes on workflows, devices, developers, testers, and users alike. In this white paper you will learn how to jump start your mobile testing lab with eleven key characteristics of successful mobile test lab programs, some of them includes: Mobile Labs to test with real devices on real networks. Use a secure, private mobile devices for your Mobile Labs to support both manual testing and automated testing. Don’t automate everything: Know what makes sense to automate and what makes sense to do manually. Know what you are testing when you first start your Mobile Lab. Integrate the tools that you know into mobile testing. Download this exclusive whitepaper on Mobile Testing Labs to learn: The challenges that mobility imposes on apps, devices, developers, testers and users Best practices to breakthrough with testing in Mobile Labs and its related components How to establish a successful Mobile Lab Testing Program.